Figure 1. Opening White Marubozu (basic candle). This article describes the Opening White Marubozu basic candle. Opening White Marubozu is similar to a Long White Candle and should be treated similarly, i.e. 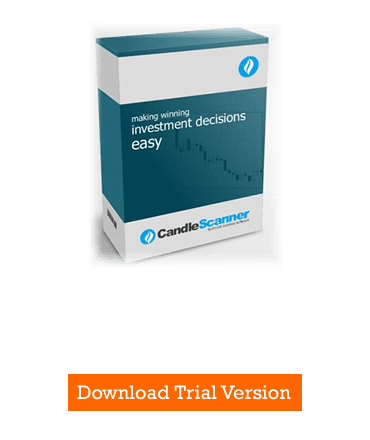 depending on the context as a reversal or continuation candle. Distinguished by the absence of the lower shadow, the body must be at least 51 percent of the total candle height. The length of the upper shadow and the context in which the candle is formed on the chart (see Bullish Belt Hold pattern) may be relevant as to its interpretation. The appearance of this basic candle in an uptrend may suggest a continuation of the uptrend, but it can also be a part of the bearish reversal pattern (e.g. Dark Cloud Cover). 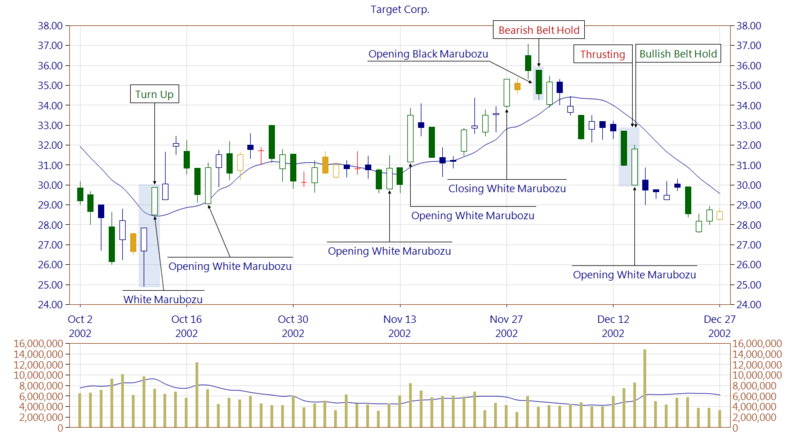 In the downtrend, the Opening White Marubozu may be part of the bullish reversal pattern. The Opening White Marubozu basic candle is considered as a Bullish Belt Hold pattern, but then a downtrend is required before it occurs, and the upper shadow should not be too long. Figure 2. Opening Black Marubozu and Opening White Marubozu occurring within Bearish Belt Hold and Bullish Belt Hold patterns. Please pay attention to the last occurrence of the Opening White Marubozu where the bullish reversal Bullish Belt Hold pattern and a bearish continuation Thrusting pattern occurred. These are so-called conflicting lines, and it is recommended to wait for 1-3 candles which will show which pattern was stronger. It is also worth looking at the chart and localize the support and resistance levels. In this case, the closest resistance area is the first line of the Thrusting pattern (a long black body with high volume). The support zone is the first line of the Turn Up pattern.